Thank You for Reading. No, Really. Thank You. Thank you, dear reader. Whoever you are, wherever you are, thank you for reading what I write. If you’re short on time, that’s the punchline, and you can stop right here. That’s where this whole essay is headed. If you’re curious how I got there, read on. One of the things that separates the human specie from the rest of the animal world is the consciousness of more than the present moment. We look back on the past, we make plans for the future, even as we experience the present moment. My dogs don’t do that. Maybe it’s what makes them seem so happy all the time. They are simply experiencing the joy of the moment. I suppose our human sense of time is such an obvious piece of information that it hardly bears stating. I read about it recently in a book I’m reading on brain science, and I find myself on this New Year’s Eve reflecting about the past year and so, today, it is for me a valuable insight. Comments I’ve read and heard from a variety of media sources are labeling 2014 as an awful year. Last Saturday on “Wait Wait. . .” Peter Segal suggested that 2014 should be the year about which we say, “Good-bye and good riddance.” According to the AP, some of the top news stories of 2014 included the police shootings and the ramping up of racial tensions, the emergence of ISIS and the continuing violence in the Middle East, the loss of the Malaysian airliner (and now another plan crash in that part of the world), the NFL controversy around domestic violence, the ebola outbreak in west Africa, the extraordinarily contentious election cycle, and the tensions in The Ukraine, including the shooting down of the passenger plane last summer. Maybe it has been a year that we simply want to put in our rearview mirror. For me, it’s been a good year. At the church I serve, a couple of losses of staff — one due to taking an assignment elsewhere, and the other a sudden death — led to a prominent sense of loss and grief. Yet, as we emerge from the grief, I find that the losses have given us a renewed sense of our ministry as a congregation. We have been given a golden opportunity to spend some time in discernment about what God is calling us to be as a congregation, and about how we do our work in the world. In the past 3 months, I’m feeling more energized and engaged in pastoral ministry than maybe I ever have. With regard to my writing, it’s been a year of contrasts. I got the report from WordPress, the platform that hosts by blog, that I posted 28 times in 2014. That’s just over 2 times a month, far less than I had hoped for when I entered the year. Part of that is due, I suppose to the events that I described above. The losses of staff members required much more of my time and attention in the short-term than I planned for. And, of course, I don’t regret making that investment. As much as writing is necessary for me to do, my primary calling is still “pastor.” I’ve also been much more disciplined in working on my fiction which leaves less time for other writing. As those of you who read this blog regularly already know, the subject matter for my blogging is all over the landscape, and has to do, I suppose with what I’m interested in in the moment. Blogging experts say find your niche and stick to it. But that’s not how I am. I’m not interested in one thing. I’m interested in the world and how I am in the world and how we are in the world. That inevitably leads to my reflections going all over the place. One of my most read blog posts of the year happened to be a review of a bed and breakfast I stayed at in Nebraska; someone from the bed and breakfast world read it and soon B&B proprietors from all over the place were reading it. I doubt they will be regular readers, but I’m grateful to have had the opportunity to say a kind and supportive word to them. As I look back, it looks like what I am most interested in is how people of faith — Christians, in particular — take concrete action to work with God to accomplish God’s healing and redemptive intentions for the good world that God has created and still cares about. What I’ve been trying to get to in this long end-of-year reflection is a word of thanks to those of you who take the time to read what I write. I’m grateful and humbled that of all the things clamoring for your attention, you would choose to invest a precious bit of that attention to some thoughts to which I have attempted to give cogent expression. I write because I need to. I need to put on paper some of the many things that rumble around in my mind; I need also to put them on paper because it forces me to clarify and remove the fuzziness of some of those thoughts. Knowing that someone else is going to read them forces me to be accountable for those thoughts. While I write for myself, I also write because I want others to read. I guess it’s an ego thing, but I like knowing that someone else is reading it. Even as I say I like that, I am sometimes amazed by it. As much as I try to tame them, I still face the demons that tell me I have nothing to say, that no one will be interested in what I’m thinking about, and that I haven’t had an original thought in years, if ever. On my better days, I can shout the demons down and live in gratitude for the miracle of language and expression and that by simply placing some characters on a page others can have some reasonable facsimile of what I am thinking and that together, the dialogue might move us all a little further along on the journey. So, as I said before, thank you, dear reader. Whoever you are, wherever you are, thank you for reading what I write. 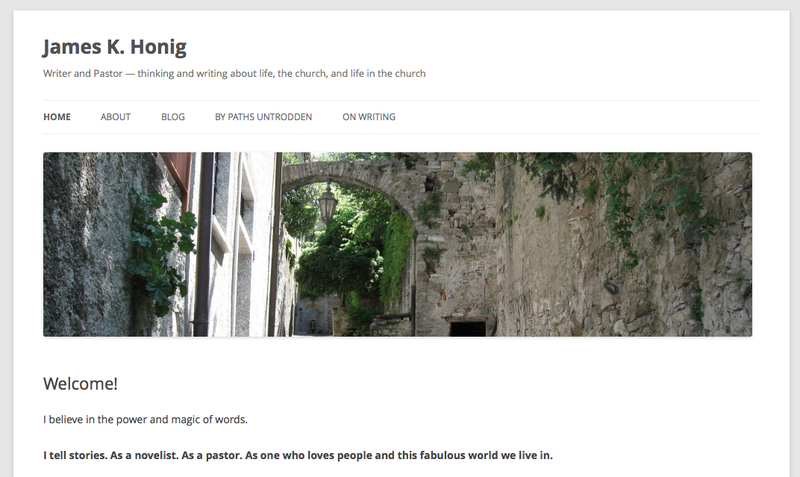 This entry was posted in Uncategorized and tagged blogging, end of year, thank you, writing on December 31, 2014 by Jim Honig. thank you Jim for sharing your musings. Wish we had a pastor more like you at our church! Blessings to you in the new year. And we read because you write. Keep at it ! Your writing always gives me something substantive to think about. The email announcing a new post most often makes me forget what I came to the computer to do–sort of like finding a hand-written letter in the bundle of junk mail that the Post Office puts in my box. Debbie, thank you. The work we do is important work. Keep writing. You need to say it. We need to read it. Blessings to all in 2015. Thanks, Lenore. Blessings to you as well! Thanks, Matt. I’m enjoying your blog as well. Keep it up! God has given you many talents two of which are your abilities to connect with others in speech and the written word. Keep writing and we will keep reading!